Popular conservationist and author Jim Posewitz poses for a photograph in this IR file photo. As we approach the 2018 hunting season, it is worth taking a moment to address our ethical relationship with the animals we pursue. 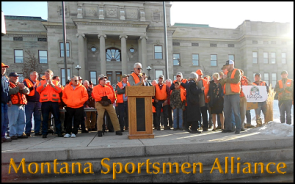 To begin with, it must be acknowledged that Montana does an excellent job of hunter education; addressing both firearm safety and ethical hunter decision making. In the process, hunters are taught there are two parts to the definition of an ethical hunter, in addition to respecting the animals hunted. One is: a person who knows and respects the law, and the other is; a person who behaves in a way that will satisfy what society expects of him or her as a hunter. When hunters take to the field in 2018, they will be presented with a growing complexity of extended seasons. In some, and perhaps many circumstances, these season options may preclude a person’s ability to satisfy all the requirements of being an ethical hunter. Montana’s general big game hunting season traditionally sent hunters afield when animals were in their peak condition and sport hunters were offered a generous five week season to pursue them in the context of fair chase. In times past, when land and wildlife managers concluded they needed special seasons to reduce the public’s wildlife, options put hunters and hunting in unsustainable positions. Past examples of that were: killing elk on the ”firing-line” north of Yellowstone Park in the 1950s and 60s; and, more recently, the buffalo liquidation north of the Yellowstone Park boundary in the late 1980s. The hunters followed the law while the managers of our public trust in wildlife, put them, and hunting, in a socially unacceptable position. In both cases, the public’s tolerance was exceeded and changes were made. In the more recent buffalo killing episode, game wardens and park rangers led shooters to every buffalo that set hoof in Montana and killed it. Public outcry was intense, and the anti-hunting movement filled their coffers. Sport hunting was vilified along with the mandated buffalo killing. As far as the general public was concerned, we were back in the 1880s, and hunter ethics was nowhere to be found. For the most part, this variety of options for killing big game is usually done to accommodate private landowners. In the case of the new shoulder seasons, there seem to be few concessions the landowners are required to make, for example finding a way to allow public access to hunters during the regular season. The 2018 result of this growing complexity is that cow elk can be legally chased for up to six months. The time window stretches from the dry heat of mid August to the period of late winter stress in mid February. That does present ethical hunters with a dilemma. This seems to meet the first standard of ethical hunting, which is to hunt within state regulation. However, from the elk’s point of view, can six months of ‘chase’ really be fair? When these shoulder seasons were initially proposed by Montana Fish, Wildlife and Parks a few years ago, Montana sportsmen objected to a number of features of the program that would have facilitated the commercialization and privatization of our fish and wildlife. To its credit, the state responded to those concerns and bull elk, and their ability to attract a private revenue stream, were removed from the formula. Perhaps it is time for the land and wildlife management agencies responsible for the public trust management of this precious resource to address the ethics of micro managing to facilitate killing wildlife and focus on issues at the core of the problem. Issues including: improving habitat quality and security on public lands, accessing private lands during the general hunting seasons, and educating all parties on the beauty of the North American Model of Wildlife Conservation. When this is done, it might put us all on the same ethical page. That could produce a relationship between us and those wonderful wild animals that belong at the center of every discussion of hunter ethics. Jim Posewitz of Helena spent 32 years with the Montana Department of Fish, Wildlife and Parks, leading the agency’s ecological program for 15 years. He then founded Orion the Hunter’s Institute, a nonprofit dedicated to the preservation of ethical hunting and wild resources essential to that purpose. Posewitz has published five books on those subjects and also served as executive director of the Cinnabar Foundation from its inception in 1983 to 2010.